Profile Theatre’s mission provides inspiration not only for the productions we put on stage but also the way in which we engage with our community. To that end, we have created our Community Profile program, through which we identify a specific portion of our Portland community that we think will be particularly impacted by our featured writer, and engage with them for a full year of community-building and artistic practice. 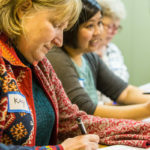 Participants have the opportunity to attend monthly writing workshops with award-winning writers and exceptional teachers, cultivating their own creative voices and using writing as a springboard for conversation and community-building. The program culminates with a public presentation of some of the original work created by participants. Read about Profile’s 2017 Community Profile: Our City’s Veterans HERE. NOW WELCOMING PARTICIPANTS FOR 2018-19! Our current cohort is for individuals who live with a chronic illness, their family and caregivers. Learn more about our 2018-19 Community Profile Program HERE. Profile’s Community Council are people from the Portland area of varying ages, ethnicities and backgrounds who are invited to view the backstage process from beginning to end and share their perspectives with our communities. We are currently recruiting Community Council members for our 2018-19 season. If you are interested in learning more, contact Artistic Director Josh Hecht. Read observations and reflections from the 2017 Community Council here.